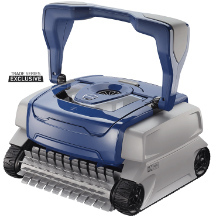 The Polaris 8050 Sport robotic cleaner delivers optimal cleaning performance for all in-ground pool surfaces. The Polaris 8050 Sport robotic cleaner deftly navigates all pool surfaces, climbs walls and steps, and scrubs the tile line for thorough cleaning. Cyclonic Vacuum Technology ensures powerful cleaning action that captures debris without losing suction, and the Push’N’Go® filter canister enables easy debris removal along with a large transparent viewing window. Additional features include the Surface Control System™ that adjusts pool surface settings for optimal wall climbing, a dual-cleaning cycle for one-touch, on-demand cleaning cycles, and a durable caddy for easy transport.